Online Booking is available for hair cuts and blow outs. However, we ask that color clients or those wishing for a new look call the salon to ensure that the appropriate time is allotted for your service. Long cuts consist of hair cuts below shoulder length. Short cuts consist of clipper cuts and sheer over comb. Single process means that a new color or toner is applied all over to create a new base color. The hair is lifted and deposited in a single step. Ombre, meaning "shaded" in French, is the gradual blending of one color hue to another, usually moving tints and shades from light to dark. Balayage is a French word meaning to sweep or to paint. It allows for a sun-kissed natural looking hair color - similar to what nature gives us as children - with softer, less noticeable regrowth lines. this technique is used in creating soft, natural looks. Partial Highlights are usually placed around the face for a brightening or framing effect. Full Highlights is when color is placed around the full head for an all over brightening or framing effect. Double Process is used when lightening hair by more than two shades. First the hair is bleached to remove natural or colored hair pigments, and then pigment is added into the hair to create the desired shade. Toner is usually the end application to enhance bleached hair. It is applied to neutralize the unwanted tones or as an enhancer. 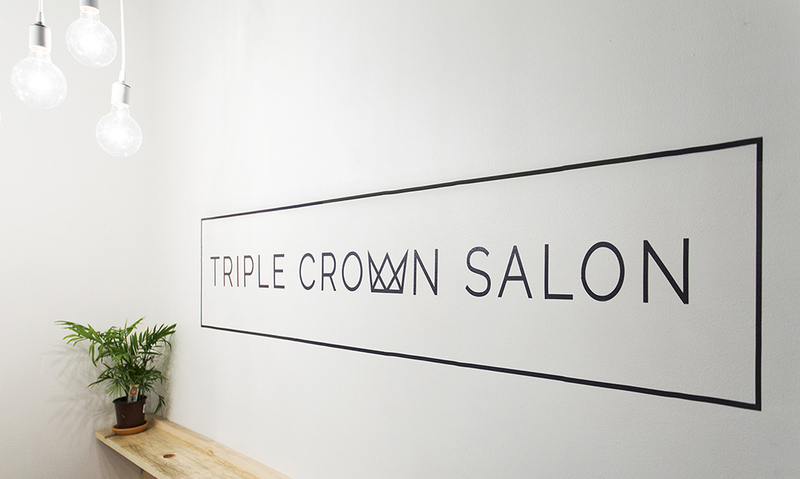 Triple Crown Salon specializes in corrective color. Please speak to the receptionist to schedule a consultation with a stylist. Blow outs are finishing looks for every day beauty and special occasions. Triple Crown Salon specializes in updos and finishing looks. Please speak to the receptionist to schedule a consultation with a stylist for special events. Bang trims are always free with the purchase of a hair cut. Want bangs? Bang creation is cutting fringe into hair that doesn't have them.